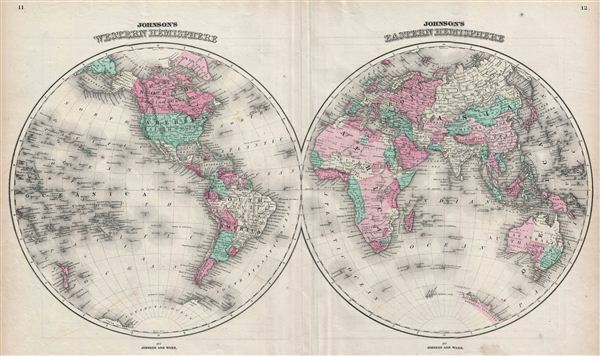 This is A. J. Johnson's fine 1866 map of the world on a hemispherical projection. Offers a fascinating snapshot of the world during a period of rapid globalization and discovery. This is one of the first appearances of Lake Victoria on a Johnson map. Just to the south of Lake Victoria, Johnson also includes Lake Tanganyika. He is clearly identifying both the Ptolemaic 'Lakes of the Nile' as he surrounds both with the Mountains of the Moon. He also identifies both Mt. Kenya and Mt. Kilimanjaro as part of this range - another Johnson first - though we know today that both mountains are in fact isolated volcanic formation and not part of a specific mountain system. The Antarctic continent is shown only sketchily, representing the relatively primitive state of Antarctic exploration in 1866. Published by A. J. Johnson and Ward as plate numbers 11 and 12 in the 1866 edition of Johnson's New Illustrated Family Atlas. This is the last edition of the Johnson's Atlas to bear the Johnson & Ward imprint. Very good condition. Minor wear along original centerfold. Text on verso. Minor overall toning.